World Exclusive: Extremely rare artwork by Kate is looking for a new home! Back in 1994, Kate took part in an exhibition of original artworks by well known people, ‘Little Pieces by Big Stars’ in aid of the War Child charity. 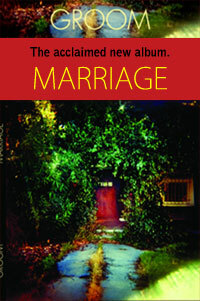 There was quite a bit of publicity around the event, organised by Brian Eno and promoted by David Bowie. 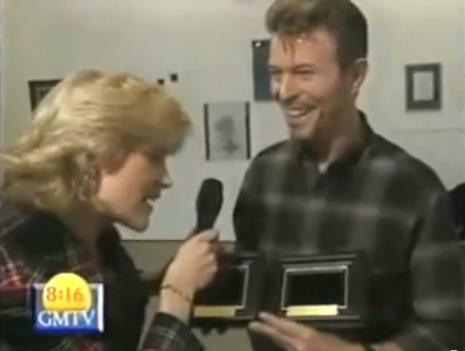 (In this Youtube clip you can see Bowie showing off Kate’s contribution, and claiming to want them for himself!). The hand made piece consists of two separate frames. Each one is 7 inches X 6 inches X 1.75 inches in size. 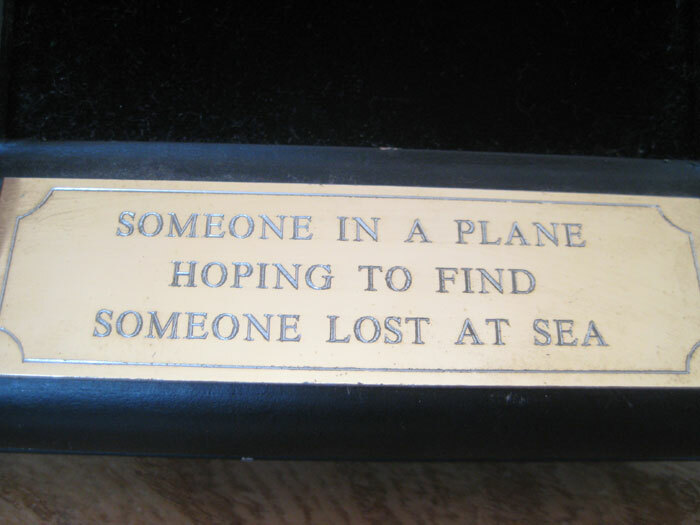 They are called ‘Someone Lost at Sea Hoping Someone In A Plane Will Find Them‘ and ‘Someone In A Plane Hoping To Find Someone Lost At Sea‘. As it turns out, a big fan of Kate’s, Neville Judd, secured the winning bid and is now looking to sell them after keeping them privately for almost 20 years! Anyone interested in contacting the seller, or making an offer on the pieces can email Neville at nevillejudd@gmail.com. (Note that the pieces were bought at auction in 1994 for £1,150, and bids of less than £3,000 won’t be considered). 35 Responses to World Exclusive: Extremely rare artwork by Kate is looking for a new home! If only I had 3K, I would gladly buy these images, they are just so Kate, everything about them is subtle but packed with meaning. maybe my lottery numbers will come up this weekend, and if they do, they will be mine!!!! What a fabulous story. I’ve always wanted to see these. They are fascinating. I definitely don’t have ANY money to buy anything right now – but as Emil said – if I did, I would! I hope they go to a nice fan who will hold open viewings. That would be amazing – what about a Kate museum? When will we have hat I wonder? A sense of humour is required to appreciate these I think. I didn’t know about these, I think they’re very clever. I’d like them. I suspect though, knowing that some very well-heeled people from the comicbook, artistic, literary, and music, etc, industries, are big Kate Bush fans, that the price could get silly quite quickly. that so clever ,..its remind me of the ninth wave ,….and my poem wave after wave ,..
For me, this goes some of the way to explain Kate’s masterpiece ‘The Ninth Wave’. She is imaging herself in the water looking up at the darkness, but also up in a plane looking down into the darkness. Is she lost in the darkness, or seeking someone to save them from the darkness? I think she wasn’t sure herself in 1994. Thankfully someone came and found her and brought her back. I remember these… Better than you could imagine!!…. I suspect, Del, that you may have given a helping hand with the electronics. 🙂 I do recall these being for sale first time around. The War Child charity was always very good at offering creative items to raise funds. I still have an unopened pack of celebrity designed Christmas cards from the 90s (?) that includes one by Kate. I have an extra 3k. In fact, I have an extra 10k. But I think I’d rather keep my money for other things. Besides, these don’t appear to have been kept in the best possible condition. Excuse me, but these are exactly, I will repeat that, ” exactly ” as they were the day I collected them from Brian Eno’s “Warchild HQ ” a few days after the event. I collected them by hand because I did not want to risk them being posted. They are incredibly delicate and are still working perfectly, which I would hope is testimony in itself to the care that has been lavished upon them. They were not kept in direct sunlight even, hence the black paint not having faded. I am not sure what you think someone does when they own something like this. In my case, they were simply hung on a wall, surrounded by music and love all that time. You are completely entitled to your opinion though of course. And by the way, whoever would like to own them will not need anything remotely like the figure you quote. That is why I simply set 3000.00 as a figure. If I was greedy then I would have just put them on EBAY but this site is amazing and I came here with them instead. I think it’s very generous of you, Neville, and it’s no surprise given that you splashed out initially for such a good cause. They do look marvelous, and it’s a testimony to your love and care that they both still work after 20 years. If I could cancel my humungeously expensive holiday this year, without losing all my dosh, I grab them in a heartbeat because I think they’re a real bargain. 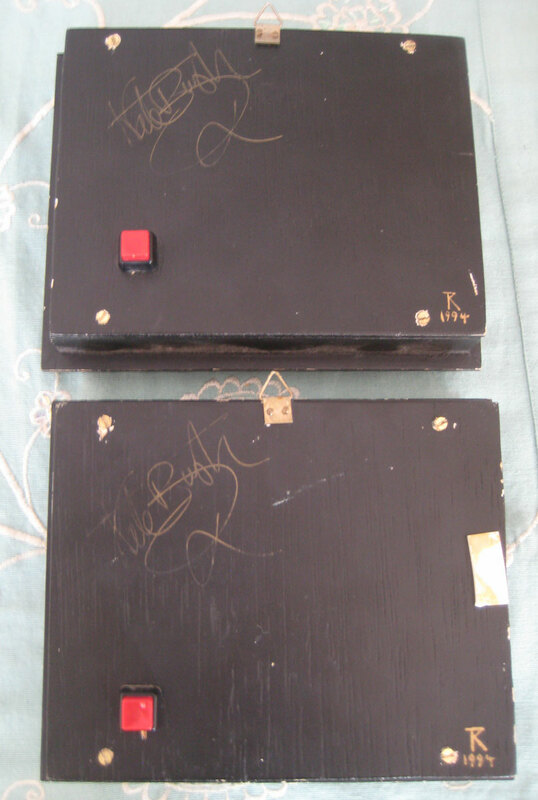 I can confirm all that Neville has said here… Knowing these pieces very well They were hand made!!.. 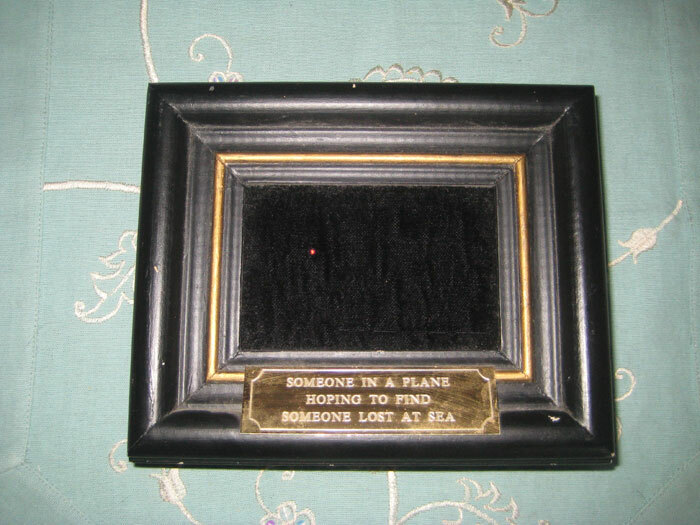 By someone who isn’t a carpenter or picture framer!… In fact I’m amazed that they have survived as they have… Testimony to Neville’s care of them.. I personally think it is a very fine piece of art and I would love to have it but I also know it will never be mine…. I just hope it goes to a true Kate Bush fan who I am sure will treasure it. Oh how I wish I had 3000 pounds, I adore Kate Bush, but I’m sure they will go to a good home! No not really. 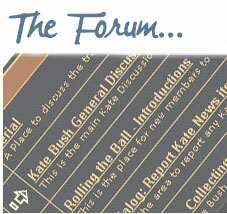 Could you imagine just how much Kate would hate a ‘Kate Bush museum’? What beautiful treasures! Thank you Neville for sharing these with us. Definitely think of “And Dream of Sheep” with the “little light shining.” Really lovely pieces. 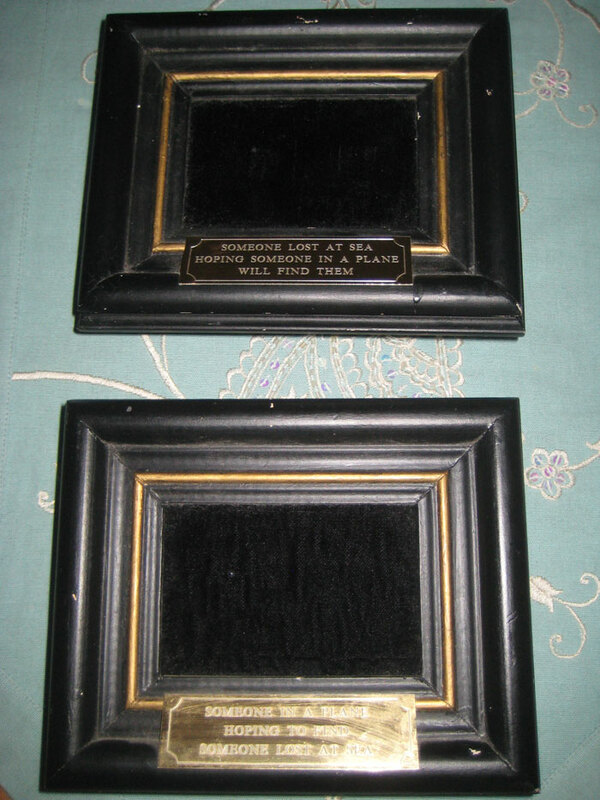 She made these framed pieces of art to coincide with the songs “Hello Earth” and “And Dream of Sheep”. The song And Dream of Sheep is about a woman lost at sea, her life vest is flashing and the “little light shining, my face is all lit up”. 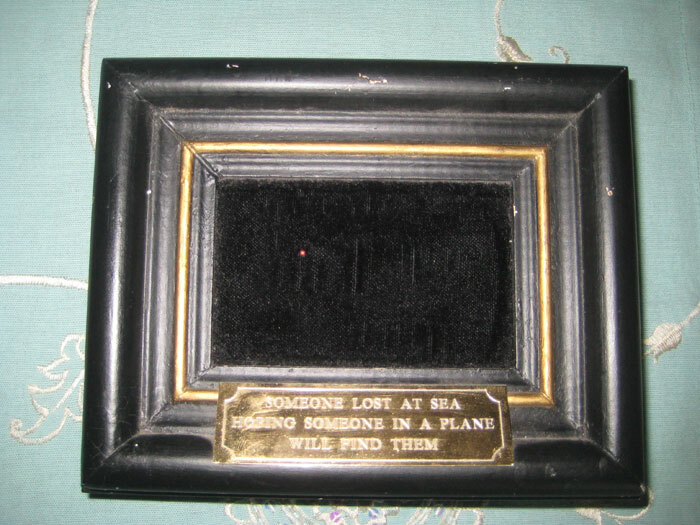 “Every gull a seeking craft” is a reference to the rescue plane searching for the woman in the water. She is trying desperately to stay away and fight the sleepiness that is over coming her from hours of exhaustion. The red flashing light in the framed photos is one for the woman’s life vest safety light, and the other for the red light of the airplane. In the interviews, Kate speaks of an airplane searching for, and eventually rescuing the woman. Though in the songs she uses the helicopter sounds. 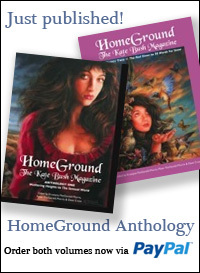 You can find the track by track discussion by Kate on Hounds of Love on youtube. oops “stay awake”* Not stay away. I know this if off subject…but, can someone explain something for us that don’t live in the British Isles. Is it likely that Kate Bush will be “knighted”? I think her title would be Lady. It seems that so many less well known people have attainted that title..and she’s such a well known and respected figure. The equivalent of a Knighthood for a woman is a Damehood. If awarded Kate would be Dame Catherine Bush. The thing with honours is that the Government let you know you’re being considered, and some people choose not to receive them. CS Lewis and Benjamin Zephaniah in their time, for example both refused honours. We don’t know for sure if Kate has been considered for an honour, although a leak from the relevant committee some years ago indicated that she was. Likewise we just don’t know what Kate’s attitude to that would be. Peter…hey thanks..that was interesting…so its “Dame” and not “Lady”…ahhh. So, you are saying there are 3 different designations as in MBE, OBE, and CBE….and they are designated by a committee? (Again I was wrong..because I assumed that one was lower than the other and you kind of worked your way up). Why do you say that Kate is past the point where a knighthood would reflect her status? (I figure that such a great honors/honours are usually given past someones prime anyway…you know I thought these awards were like lifetime achievements..and no one would really get one you know until years later..so thats not necessarily so?). I can’t really say how she is seen in the UK…but, she’s really well respected where I live….an an artist of the highest order. My point was a knighthood – for Kate a Damehood – would now be the right level for her status. The Order of the British Empire, which is the general order of Chivalry for the reward of merit has these various levels – at the bottom is the newly dusted off British Empire Medal which they give i.e. to long serving children’s road crossing attendants, then there’s the MBE (“member” of the Order) which the Beatles for example were awarded by Prime Minister Harold Wilson back in the 1960s. Next up is OBE (“officer”), then CBE (“commander). The first rank to carry a title is KBE/DBE (“knight” or “dame”) and above that you have the GBEs (Knight Grand Cross or Dame Grand Cross) of which they dish out very few. I would say Kate ought long ago to have been considered for the MBE/OBE, and for all we know may have been. At this point I’d argue nothing less than a DBE would meet it. Elton John, and Paul McCartney are Knights Bachelor though that knighthood is not part of the Order of the British Empire, but Elton is also a CBE and Paul from way back when is an MBE. Confusing init? Luckily for the women there are no such complications. Women who are thought to be deserving of the damehood get a DBE. Peter, I really have to read up on this. I really think that Kate deserves to be knighted. I appreciate your response! You could have easily referred me to a post in the forum (if one even exists). Of course I don’t know here…but, I do think Kate would accept (I think Elton John would not allow her to decline…LOL). King Kate of The Dreaming Islands. I think the two pictures are wonderfully witty and poignant. As to the comment about them not being in the ‘best of condition’, well, if they were entirely made by Kate herself, I can speak from experience that mitred corners are hard to do, but the idea behind them is wonderful. 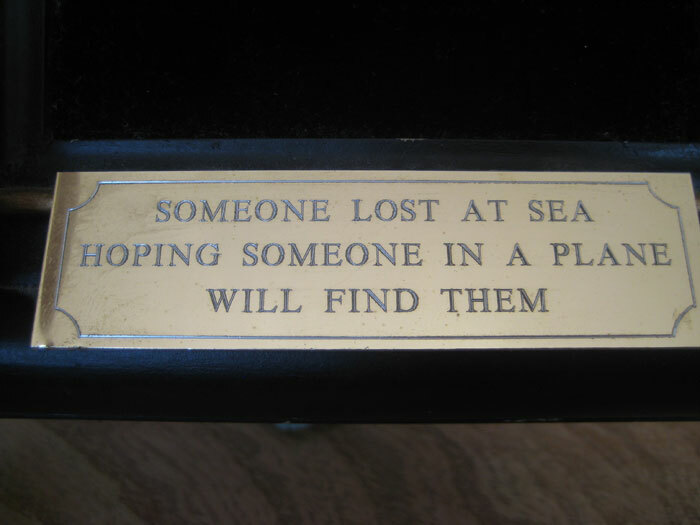 I hope they will find a happy home with someone who appreciates them. I’d love these …. writing to you as I write this Neville! I must say I’m very tempted by the pictures if they’re still for sale….. *very* tempted indeed. And I could absolutely guarantee they would be loved, cared for and appreciated by a fan and fellow musician. I always wanted a classic Victorian rocking horse, not just any old rocking horse, it had to be of a specific ”type”…..I searched for years, and bought several ”lesser” ones to my dream, and then, one day, a friend told me of one at auction….it was all that I wanted in a R/H, [huge, shabby, unrestored, magnificent on huge bow rockers] and the estimate was £2-3k. Such things will not come by a second time, so grab that special item while you can. I never regretted for a second spending out on that horse, I love and cherish him, so if you really want these pics, push the boat out!!! Yes, Guitars….Expensive things, for sure…especially if they are remotely ”vintage”…eg, a Les Paul 1959 Standard in sunburst tigerstripe… [had a partner who was desperate for one of these…in the early 80’s and made do with a Les Paul reissue, which he still has. But I know he would dearly love the mellow appearance of the real thing. Following the release of “The Dreaming” KT apparently told a magazine that her oddest dream was of her alone in a boat drifting at sea. The odd thing being that she didn’t want to be found. Anyway, I think this artwork resembles Filippenko’s prize winning image of a black hole.